We love it when our suppliers make their closeouts and overstocks available to our shop instead of selling them to T J Maxx or Marshall’s. The fact that customers can find products at these discount outlets very similar to the ones we’re offering at full price makes us independent retailers look bad, and cheapens the perceived value of these products. 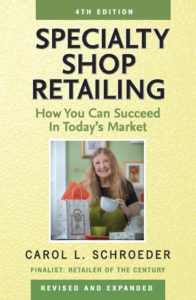 But when our store is able to buy closeouts and overstocks, we can put the reduced-price items to good use. Sometimes we are able to blend them in with our other full-price merchandise, significantly increasing our margins. Having some items at 200% mark-up helps compensate for mark-downs on slow-moving goods. We’ll often split the difference and offer the bargains that we’ve found at a reduced price to our customers. We will mark the item with the regular retail price and then a sale tag showing how much the customer is saving. For example if we buy a box of notecards for $2 that is normally $4 at wholesale, we will tag it as regularly $8.00, now $5.95. Half-price sale goods also work well for a “buy one, get one free” promotion at the original retail price. They can also be used as a “gift with purchase” to help move an expensive item by adding to its perceived value. We also look for closeouts for giveaways. 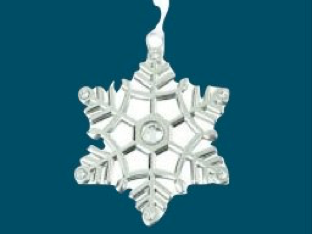 This week we are offering a Ganz pewter snowflake ornament that we purchased as a closeout for free to those who get our e-mail newsletter. Another batch of closeout ornaments is going to be used by our local children’s theater to help promote their production of A Christmas Carol. Buying the ornaments at half of the normal wholesale considerably extends the value of our donation. Two caveats for your bargain hunting, however: as with any sale, it’s not a good deal if the merchandise is something you wouldn’t buy otherwise. The items must be of first quality, and fit with your merchandise selection. The other caution is that you make sure that the sale price is really a significant savings. A closeout at 10% (or even 20%) off may not be worth buying, especially if it’s not something you’d purchase at full price. But it can be a smart move, especially as the year draws to an end, to ask your reps and supplier if they have any good buys that you can put to good use.